Cooking can open up a new world for your child. 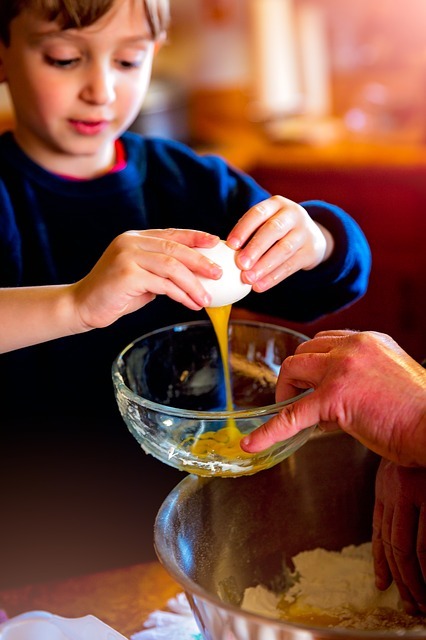 One often-overlooked teaching opportunity is through cooking and baking with your child. But, it can be a great way to spend quality time together. You might be surprised by all of the ways that cooking, which may seem like an ordinary activity, can open up a new world for your child. Learning to cook is an important skill for any child, and cooking skills will help a child with a disability take a large step towards learning independence. Even for the most basic recipe, cooking and baking give opportunities to teach following instructions, reading, and problem-solving. The activity of cooking is a great example of natural environment teaching because you and your child can cook right in the familiarity of your home kitchen. Cooking will give your child a sense of autonomy and a life skill that they will carry into adulthood. Cooking and baking are both great examples of sensory play opportunities. You can give your child a sensorily immersive experience through cooking which will not only help with sensory integration but also help them learn to apply their senses to completing a task. Cooking involves all of the five primary senses and can fit to any learning type. If you think of cooking as complicated and potentially dangerous, then remember that at its basic level, cooking can be worry-free. With the right recipe, cooking is a very forgiving activity because you don’t have to always be precise. Even just making a small sandwich is an easy and fun way to introduce your child to cooking. Then you can work your way up to more involved recipes over time. If there is ever something that involves knives or a hot stove, then you can limit your child’s level of participation to what is safe for them. Above all, this should be fun for both of you. Learning to cook is a life skill for children of all ages, and there’s no reason that any disability should stop them. The Connections Therapy Center is a top therapy center serving families of children and adolescents with disabilities. Our team consists of the leading experts in the fields of pediatric speech, occupational therapy, speech-language pathology, and behavior sciences. We offer intensive, hands-on therapy for children and adolescents as well as resources for families. We are real therapists helping real families with real issues. If you are concerned about your child’s behavior, take a moment to fill out our quick questionnaire. If you’d like to schedule an appointment, call 202-561-1110 (Washington, D.C. office) or 301-577-4333 (Lanham office) or contact us via our website. Want to keep up with our latest news and blog posts? Follow us on Facebook, Twitter,Google+, and Pinterest. This entry was posted on Monday, April 1st, 2019	at 3:37 pm	. You can follow any responses to this entry through the RSS 2.0 feed. Both comments and pings are currently closed.